Harvest Moon has, by now, produced its own strange little niche genre of farming sims. 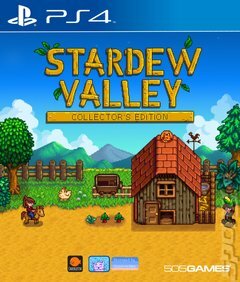 On one end, you have the 3D polish of the likes of Farm Simulator, but on the other you have the pared down charm of Stardew Valley which, while it's being published by 505 Games is actually the work of just one man, Eric Barone. The game starts with you quitting the rat race and taking on the job of managing the farm left to you by your grandfather. You'll need to start by clearing the land, but beyond that what you plant and how you manage your new farm will be up to you. In the early days you'll need to put in some hard graft to build up a bit of capital, but if you manage your stamina well and plant well you'll earn enough to start thinking a bit more creatively. In no time you'll be venturing into the village to find a wife, heading down the mine to fight monsters and gather ore and generally creating compound benefits from your activities that will enable you to grow your harvest and reap the rewards. It's a game that very much shows its RPG roots with a 16 bit visual style - one that captures the sweet, simple charm of Stardew Valley's imagined rural lifestyle. Out in the real world farming is a tough business with long hours and serious challenges, but in Stardew Valley it's a sweet getaway from the rigours of modern life.